A sneaker inspired six eyelet oxford. Fabric linings and padded insole. EVA midsole. Rubber sole. 1 1/4 inch rope covered platform. Made in Spain. Our designers live and breathe Vidorreta‘s philosophy, seeking out fashion trends which can coexist with the comfort and ecological friendliness of our espadrilles. This idea is the foundation upon which Vidorreta’s design philosophy rests. 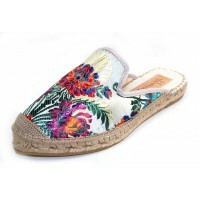 The motifs and details are what distinguishes a shoe designed and created for each different, particular and special woman from the common espadrille. A sneaker inspired six eyelet oxford. Fabric linings and padded insole. EVA midsole. Rubber sole..